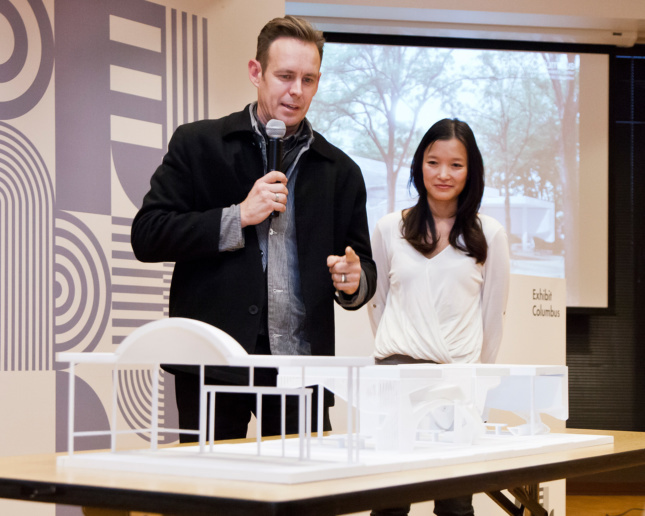 On December 10th, ten finalists descended on Columbus, Indiana, to present concepts for the inaugural J. Irwin and Xenia S. Miller Prize Competition. The competition is the part of Exhibit Columbus, a yearly architectural event held to highlight the city’s vast collection of architectural masterpieces. Along with the competition, all ten finalists participated in the opening symposium for Exhibit Columbus earlier this fall. The format of the competition is not typical in that teams are paired head to head on each of the five sites. 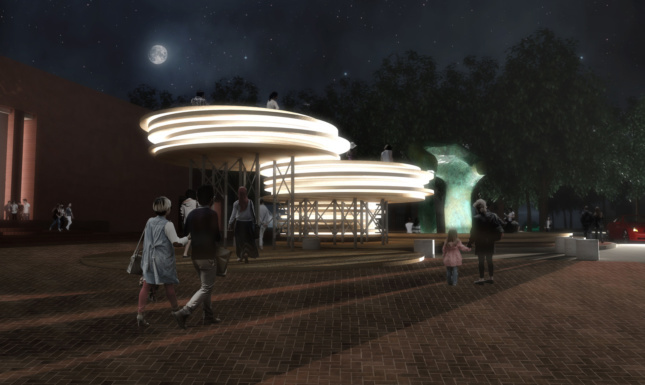 From the ten proposals, five will be awarded the Miller prize, one for each site, and given the opportunity to develop and build their installation for the 2017 Exhibit Columbus. Winners are expected to be announced in January 2017. 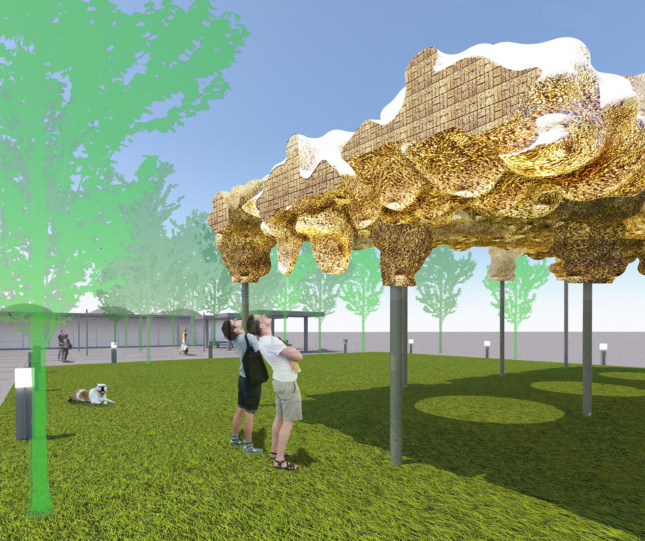 Joining the five installations will be more than ten other installations by international designers, students from universities across the Midwest, as well as local students. 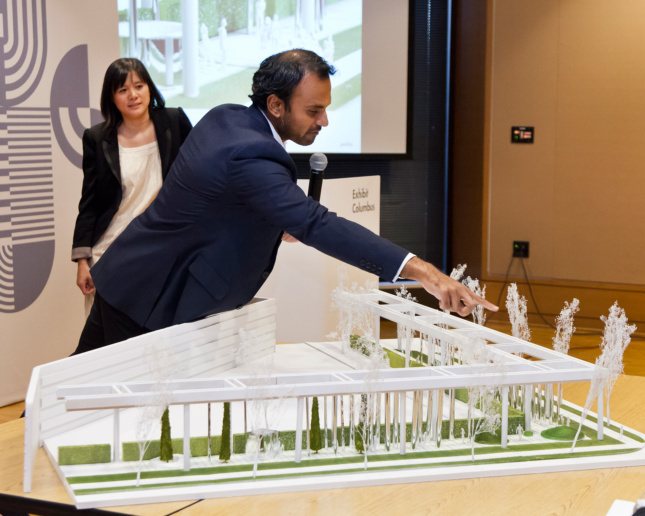 “With such a talented group, each project was an incredible new idea for the jury to consider. Our expectation is that this event will have a big impact on the Columbus community for years to come,” said Richard McCoy, director of Landmark Columbus, the organization that created and runs Exhibit Columbus. Site number one is the First Christian Church by Saarinen and Saarinen, built in 1942. 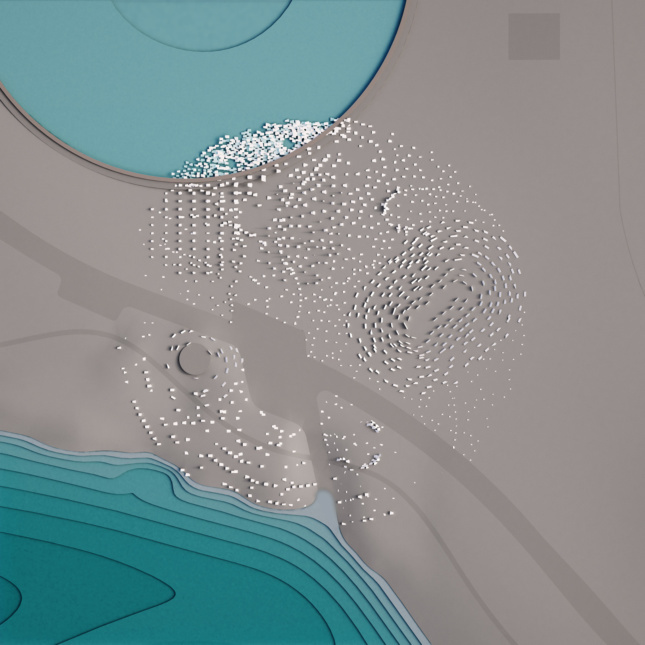 For the site, Boston-based Höweler + Yoon proposed Pattern Pavilion. Taking cues from the decorative motif carved into the stone on the church and referencing other Saarinen projects, the Pattern Pavilion extrudes the 2-D geometry into a volumetric canopy. 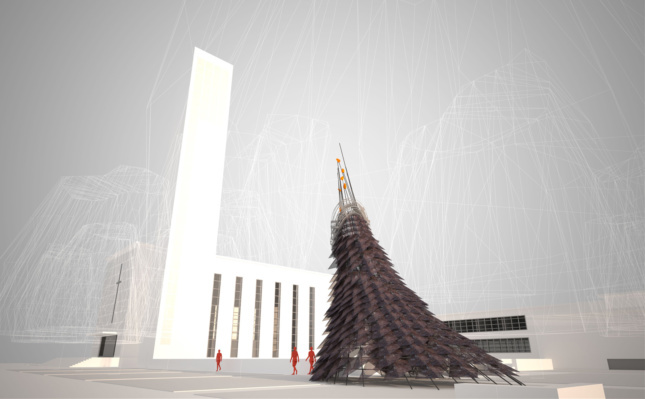 The alignment of the project frames the Church and the I.M. Pei-designed library across the street. Also competing for the First Christian Church site is Milwaukee-based studio:indigenous. Inspired by the dwellings of the Miyaamia, the indigenous people of central Indiana, Wiikiaami is a contemporary take on the wigwam. Clad in copper scales, the project aligns with the church’s famed campanile and the autumnal equinox. Across from the First Christian Church sits the second site, the Cleo Rogers Memorial Library, designed by I.M. Pei and Partners by 1969. 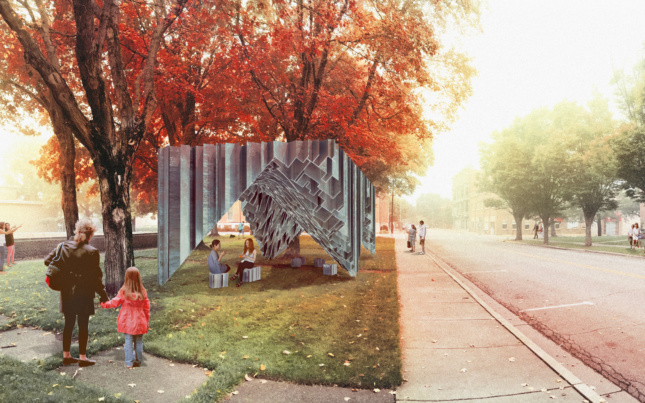 Boston-based IKD’s Conversation Plinth was inspired by the conversation pit in the Miller House as well as the plinths that elevate the landmarks surrounding the Library. 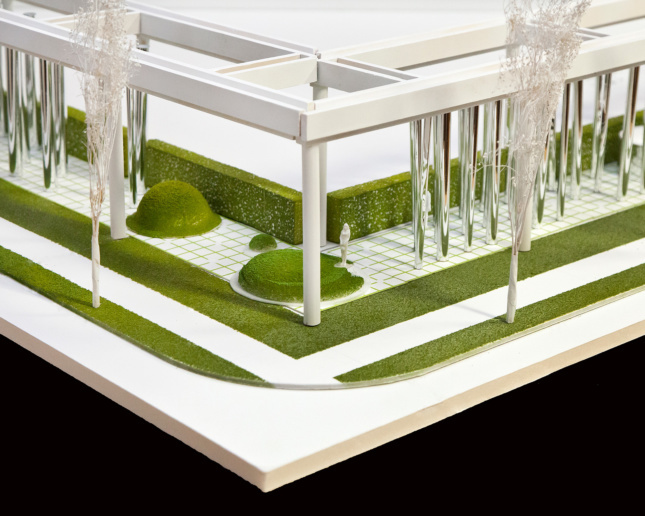 The design calls for large shifting timber plinths to wrap through the library’s front plaza. 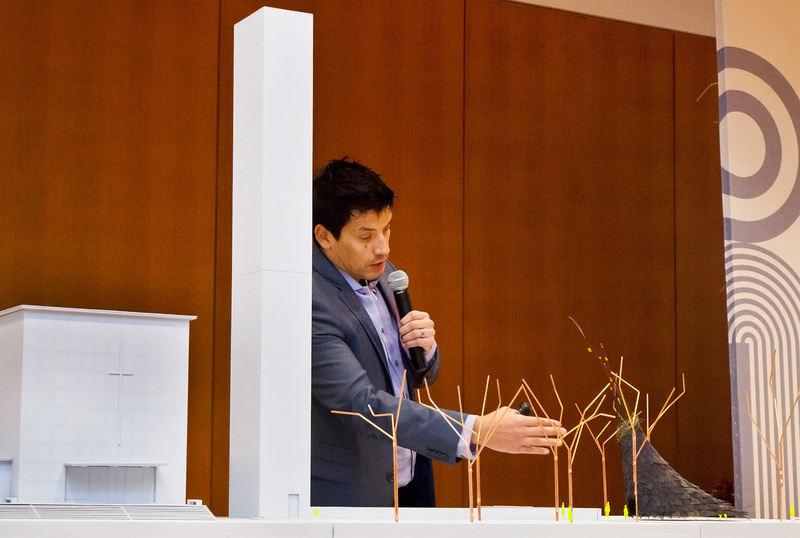 Competing against IKD is the collaborative team of Los Angeles-based Johnston Marklee and Jonathan Olivares. 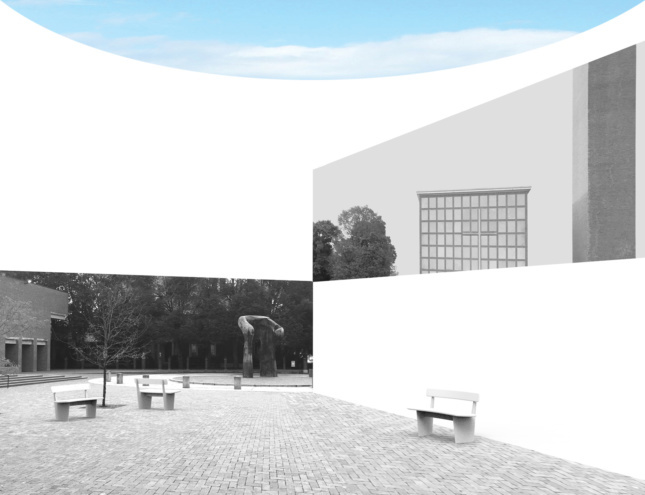 Their View Room and Conversation Benches is a roofless structure which frames views of the library and the surrounding sculptures. The 1954 Irwin Conference Center by Eero Saarinen and Associates is the third site. Los Angeles-based Ball-Nogues Studio designed Bank and Trust in Paper (a reference to the building’s original name) which echoes the plan and roof of the low-slung structure. Made of a waterproof treated recycled paper, the canopy is molded in forms reminiscent of Saarinen’s designs such as the iconic tulip chair. Untitled, by Los Angeles-based Oyler Wu Collaborative, is focused on three main concepts: Euclidean geometries, solid/void relationships, and tectonics. The design completes spaces implied by three canopies, originally part of the drive-up bank. The team adds new walls which are solid, built of thin lines, or carved away into voids. The fourth site is Kevin Roche John Dinkeloo Associates’ 1983 Cummins Corporate Office Building. Los Angeles-based Baumgartner + Uriu’s Machines Suspended extrudes the saw-tooth pattern of the office building’s layout into a three-dimension multi-directional object. 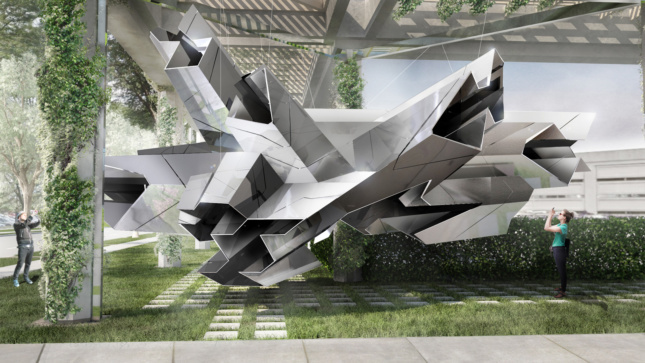 Hanging in the building’s colonnade, the object defines new spaces and ways of habituating the space. 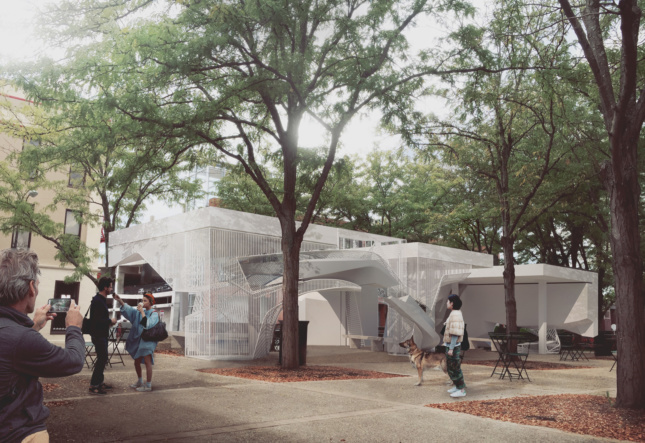 New Haven-based Plan B Architecture & Urbanism’s proposal Anything can happen in the woods transforms the site’s colonnade into an urban forest of reflective columns. The surrounding greenery and built structure reflect in project. The final site is the Mill Race Park, designed by Michael Van Valkenburgh Associates with architecture by Stanley Saitowitz in 1992. Another Circle by Tuscon and New York-based Aranda\Lasch adds a henge-like stone circle to the park. Using 2,800 pieces of salvaged Indiana limestone, the 3.5-acre stone circle ties together the park’s lake, pedestrian trail, and river. 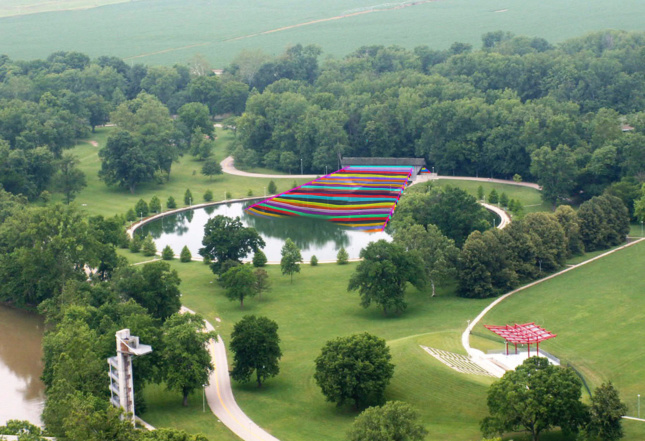 Tulsa-based artist Rachel B. Hayes Studio proposal Chroma Connection is comprised of colorful ripstop nylon. Stretching through the site’s covered bridge into the lake at the heart of the park, the projects is meant to appear as if it is built out of pure color.